Simi Valley Tree Care provides tree care and tree services here in Simi Valley, CA and the surrounding areas. Our tree service experts and arborists pride themselves on being among the best local tree services experts anywhere in Simi Valley and especially near you. There are expert tree cutters in Simi Valley trimming trees right now, near me? No way, can't be. Oh yes, it's true, we are cutting, trimming, pruning and grinding all the live long day, so you you don't have to. Yes we are the local Simi Valley tree experts and are happy to take care of all of your tree service needs. We only work with the best and knowledgable tree care professionals who are trained and ready to help. ​Simi Valley is a wonderful place to live and truly has some beautiful trees. From newly planted to mature trees we can help care for all of them. We care about all of these great trees but even more importantly we care just as much about our customers. We have built solid relationships by always going out of our way to make our local tree service and tree care clients and customers happy. We are good at what we do and would appreciate the opportunity to gain your tree care business. ​We do both residential Simi Valley tree work and also have many commercial Simi Valley tree care customers. Simi Valley Tree Care services the local Simi Valley area and the surrounding cities such as Moorpark Tree Care, Chatsworth Tree Care, Thousand Oaks Tree Care and Sylmar Tree Care. We have happy tree customers all over the Los Angeles metropolitan area. If you are not in Simi Valley give us a call and we can either help or point you to a tree care professional in your local area that we would recommend for you tree care needs. 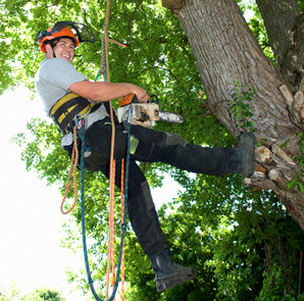 We use the right tree service equipment for the job and safety is a priority with everything we do. Our Simi Valley tree trimming crews are not only experts at what they do but also try to do it with a smile. There are many choices of companies to take care of your trees but we like to think that we go the extra mile and do just a little bit more to make you happy. We would love to handle your tree care needs in Simi Valley, CA for many years to come. Call us today at 805-303-5332. Simi Valley Tree Care knows tree pruning better than anyone. It’s probably the thing we do most and we always use proper procedures to make sure that your tree stays safe and healthy. Trees out in nature do fine without pruning but the trees in our yards and property need upkeep and maintenance. We know how each cut will affect your tree and we take great care to make sure that we don’t cause any damage to your trees. When branches and leaves are removed from a tree it can affect growth so great care and knowledge must be taken to keep your tree growing as desired. 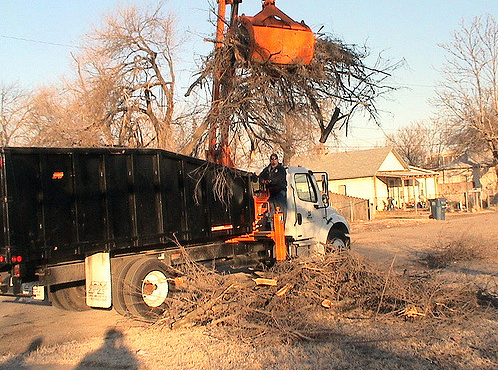 Dead branches are removed in order to reduce hazards. Tree limbs can become crossed and twisted and pruning can also help slow the growth of an out of control tree. We work with only the best tree pruners in Simi Valley. Simi Valley tree pruning essential to the health of your trees. 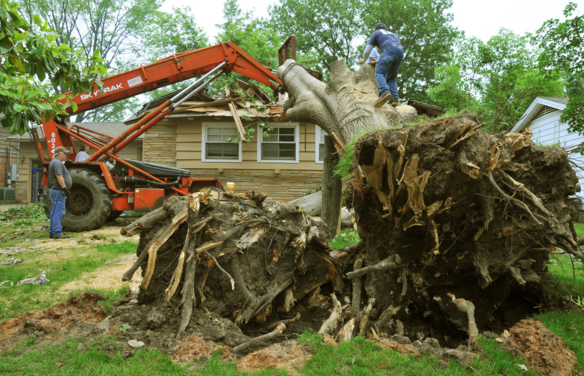 Wind damage and emergency tree service are things we handle often so don't hesitate to call any time day or night. We also do shrub pruning and shrub trimming. Call us for all of you your Simi Valley shrub care needs and a tree doctor will help you with your questions. We can help after hours and 24 hr service is just one way that we are always there for our customers. Tree cleaning in Simi Valley or deadwooding is when we remove branches which are dead or starting to die. Weak, dying branches are a problem and must be cleaned from the tree in order to keep these problem branches from becoming a hazard. Crown cleaning is important to remove those branches which are preventing sunlight and airflow from reaching all parts of the crown of the tree. The crown can become too thick or dense and so by reducing or thinning the tree crown we can reduce the size of your tree and keep it growing for years to come. Simi Valley tree topping is when branches and limbs must be cut back to a lateral branch or stud as these limbs are not strong enough. We also elevate and raise the crown by removing lower branches. This is done in order to keep pathways and access below a tree. No one likes walking into low hanging tree branches so these must be maintained for safety. Whatever your tree pruning and maintenance needs we at Simi Valley Tree Care are here to help. Call us today at 805-303-5332. Our tree removal service is second to none and we have removed many small and large trees over the years. How much does it cost to cut down a tree? Good question but the answer isn't so simple. Tree Removal costs can vary depending on the size, species and location on your property. Some customers do not wish to have the stump removed, which can save money but is not always recommended. Our stump removal services will get that stump gone. Cutting down trees is serious business that you should not leave to unqualified tree companies. Call us first for a free estimate and we will save you on your tree cost maintenance. We've been cutting trees and trimming trees longer than many and will send a tree surgeon to help you with you damaged or nuisance tree. Tree cutters are cheaper in the long run than letting that problem tree cause more damage in the future. Our tree doctors will give your tree a thorough check up and dangerous trees are taken down with skill and precision. Our affordable tree arborist services have been a great help to many of your neighbors. We are tree specialists and do we are always looking to do the best tree work and offer the best tree removal service prices in the Valley. Call a professional arbor company and save the headaches. Many tree cutting companies can offer great service but unfortunately many unlicensed tree workers out there will just leave you with problems and your tree may be worse off by hiring them to service your trees. We are your local tree service in Simi Valley and hope to always provide you with more than our competitors. Simi Valley Tree Care are your local experts at tree removals in Simi Valley, CA. We have the tree cutting and removal equipment and knowledge needed to handle all tree removal situations. We prefer to do what we can to save trees rather than remove them but there are sometimes, unfortunately, trees must be cut down. This is not a matter to be taken lightly as chopping trees down safely and efficiently takes knowledge and experience. Tree cutting in Simi Valley is one of our specialties. We can cut down your Simi Valley trees if that is what you want or need. Simi Valley Tree Care uses only the best equipment when we tackle Simi Valley stump removals and stump grinding. Stump grinders are a piece of power equipment that has a cutting wheel. Carbide teeth grind away at the wood. Not only will removing that old stump make your yard or property look better visually, there are also more important reasons why you should let us remove that old stump for you. They aren't just ugly, but can also be potential hazards sitting there waiting for a potential injury or lawsuit. Not only are those big Simi valley stumps trip hazards and responsible for many injuries, they are also home to many insects including harmful termites which you don't want near your house or business. Animals and fun little guys such as rats, snakes and even possums have also been known to set up shop in stumps. Tree roots are what supply nutrients, water, air as well as the support system that keeps the tree standing. Large transport roots are what grow and cause sidewalks break and cause hazards and cracks. Most of the Simi Valley trees roots are not that deep in the ground and rather than grow deep below the surface, roots often grow away from the tree laterally. We take great pride in removing roots and keeping your property safe and looking great. Call us now for a free Simi Valley stump grinding quote at 805-303-5332. Tree Evaluations and Injections in Simi Valley? You mean shots, like at the doctor's office? Well, yes, kind of..trees do get sick and suffer disease just like we do. Tree injection is a method of drilling into the tree and inserting nutrient plugs. We are targeting precisely where nutrients, fertilizers, fungicides and insect fighting compounds can best reach the inner pathway of the the tree. Injections are sent directly into specific parts of the trees. Just like humans, trees have a vascular system that will deliver the "medicine" to where it needs to go. Trees can suffer from many different diseases such as Chlorosis, Dutch Elm Disease and Sycamore Anthracnose. We do Bark Beetle Prevention treatments. Our systemic treatments have been very successful where other tree companies have not. We can help diagnose your tree and find out what is wrong with your leafy friend. We have had great success in treating trees, having all sorts of problems, with tree injections. We'd love to come diagnose your tree so call Simi Valley Tree Care today at 805-303-5332. Tree Cables and Bracing..what's that about? We dig saving the trees. Rather than remove a tree we can many times save trees with the use of specialized tools and equipment to support a tree. There are many reasons why trees sometimes need to be stabilized. Weak branches due to storm damage, rot and decay, insects or stunted growth. In these cases, braces or cables are used to support or save a tree or part of a tree. We have the experts at the art of Simi Valley tree cables and tree bracing and we love being involved in saving trees one limb at a time. With a little support some trees can be helped and continue providing the enjoyment they do. Simi Valley's Best Brush and Yard clean ups too..Wow! Dangerous brush should always be removed and we are the ones to tackle that job for you. We love that stuff, sure not as fun as trees but we love to offer many additional services to our customers. We want to be your one call for anything tree, brush or yard related in Simi Valley. Fire hazards, pest and insects, city ordinances, HOA's and just plain old pride of ownership are all reasons to call us today to get that overgrown Simi Valley yard or that big hill cleared. Brush removals in Simi Valley are just one more way we are helping our customers keep their properties safe and looking great. We will get that stuff out of there and keep your property maintained. ?Ok now we're talking, let's plant some trees baby. Lot's of glorious trees. How many do you need? 1 or 100 we would love to plant some trees in Simi Valley with you. Let's discuss your needs, where and why you want to plant them and figure out the best trees for your Simi Valley property. Many considerations have to be thought of before just planting a tree, as much as we like the idea of "just planting a tree" that is a great idea most of the time but without some forethought and planning that tree could have to be moved or removed down the road. Which we will gladly help you with but we'd rather get that right tree in the right place from the start. Call us today at 805-303-5332 to discuss your Simi Valley tree planting needs and concerns. We love talking about trees. Maybe you have a tree on your property that you want to move somewhere else or your moving and have to take that special tree with you. Well with the right tools, knowledge and determination anything can be done and we'd love to be the ones to make your Simi Valley tree move a success. Tree transplanting is not always possible and there are times we will recommend not doing so. Let us evaluate your tree transplant request and let you know if it is possible and likely to succeed. We've had good success with some species of trees but others are not good candidates for a tree move. Our arborists are waiting to discuss your tree needs. Our low cost tree services are second to none. Call us today at 805-303-5332 for all of your Simi Valley tree work. Thanks for visiting our website. We started in Simi Valley and will always be Simi Valley Tree Care but we also provide tree service the surrounding areas and most of Southern California. We cater to the immediate areas of Chatsworth, Moorpark, Sylmar, Thousand Oaks. Newbury Park, Westlake Village, Agoura Hills, Oak Park, Hidden Hills, Calabasas, Woodland Hills, Granada Hills, Canoga Park, Northridge, North Hills, Encino, Sherman Oaks, Pacoima, Panorama City, Van Nuys, Studio City, North Hollywood, Burbank, Winnetka, Reseda, Tarzana. We could go on and on about all the cities we service but if it's in SoCal and it's a tree job we are the ones to call. Call us today at 805-303-5332. Our prices are competitive and while we can't always be the lowest cost tree service, we will always try to meet or beat our competitors prices. Call Simi Valley Tree Care today at 805-303-5332. 1197 East Los Angeles Ave.